Dr Selwyn Richards, FRCP, (GMC No 3559820) qualified in medicine at Oxford. He went on to complete his specialist training at Kings College Hospital, London. He gained the Diploma in Sports Medicine (RCS Edinburgh, 1997), was awarded a three year NHS Research Training Fellowship and received a distinction for his MSc in Rheumatology (University of London, 2001). 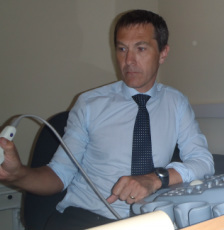 He was appointed as a Consultant Rheumatologist for Poole Hospital NHS Foundation Trust in 2001. He leads the Poole Acute Back Pain Service, is lead clinician for CFS/ME services for Dorset and Clinical Champion for CFS/ME for Hampshire, Dorset and IoW. He is actively involved in running clinical research including his own investigator initiated studies. He has been the Chief Investigator in the UK for some multinational clinical trials and the Principle Investigator at Poole for studies, especially in fibromyalgia and rheumatoid arthritis. He is frequently asked to lecture both at local and national meetings. Please see the Research and Publications section of the website for more information on his research. Dr Selwyn Richards is a keen sportsman, currently competing in marathon and wild water kayak races. He enjoys spending time with his family, fishing and gardening.